Ho Chi Minh City is still affectionately known to many as Saigon, and the Omni Saigon Hotel is conveniently located in Ho Chi Minh City's bustling Phu Nhuan District. Omni Saigon Hotel's location makes life easy for business and leisure travelers alike. With the hotel just 10 minutes' drive from Tan Son Nhat International Airport and 15 minutes' drive from the center of Ho Chi Minh City, hotel guests can see the sights and explore the city with ease. Add the Marco Polo attention to detail, attentive service, and excellence and you have everything to make you feel right at home in this exciting part of Asia. 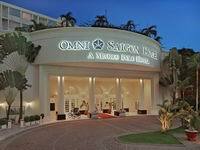 Omni Saigon Hotel offers 251 elegantly appointed hotel rooms, suites, and serviced apartments. All hotel rooms are provided with an executive-sized desk, cable television, bathrobe, minibar, and a host of other amenities specifically designed for your comfort and convenience during you stay at the Omni Saigon Hotel. For the ultimate in hotel accommodations, facilities, service, and privacy, the hotel's Continental Club offers a private lounge, a broadband Internet workstation in English and Japanese, butler service, and complimentary buffet breakfast. The hotel's superb facilities for meetings, seminars, conferences, weddings, and grand celebrations make Omni Saigon Hotel the number one choice for your Saigon event for up to 400 guests. Omni Saigon Hotel's five restaurants and bars offer a wide range of cuisines from à la carte Asian and international to Japanese and Cantonese, as well as Mulligan's Irish pub, with its distinctly club atmosphere. Omni Saigon Hotel, Vietnam, offers 251 elegantly appointed rooms, suites and serviced apartments. Non-smoking rooms are also available. Room amenities include executive-sized desk, individually controlled air conditioning, IDD telephone, private bathroom with telephone extension, bathrobe and bedroom slippers, hairdryer, ample-sized closet, electronic bedside consoles, minibar / refrigerator, coffee and tea making facilities, cable T.V. and in-room safes. Deluxe Rooms:The 323 square feet/30 square meter accommodation is tastefully furnished in elegant design and provide well appointed comfort to business travelers. Premium Deluxe:Specially designed to meet the requirement of today’s corporate travelers. Junior Suite :The Junior Suite features a spacious room with sleeping area closed off by a sliding door. Club Suite:Club Suite amenities include fax machine, flat-screen T.V., spacious double bay living area with dining table, well-appointed bedroom and bathroom with separate shower. Continental Suite:Elegantly decorated double bay living area with separate dining area, pantry, large poster bed and spacious bathroom with separate shower. The Suite is completed with fax machine, DVD player and stereo hi fi. Recreational facilities include The Saigon Gym, outdoor swimming pool and Qi Spa to help you relax after a long day. The Saigon Gym:The Health and Fitness Center include a well-equipped, sauna, steam room, and swimming pool. Daily, including public holidays - 6:00 am to 10:00 pm. Swimming Pool:The hotel's outdoor swimming pool, located on the 3rd floor, is exceptionally inviting on a sunny day in Saigon. Qi Salon and Spa:Overlooking the spacious outdoor pool, the Spa is composed of 14 treatment rooms, including two rooms specially designed for couples. These exceptional VIP Suites feature a private outdoor terrace with open-air Jacuzzi. Qi Spa also features a Salon with hair stylists and manicurists for pedicures and nail paintings. Qi Signature dishes are available; A choice of different foods from a carefully designed menu to complete the well-being program. Open: Daily 9:00 a.m. - Mid night. Cafe Saigon:Located on the ground level adjacent to the lobby, Cafe Saigon seats 154 diners and offers a la carte Asian and international cuisine. Popular for its breakfast, lunch and dinner buffets with teppanyaki-style action counter and a wide selection of legendary French-style and Italian breads. Daily - 6:00 am to 10:30 pm. Nishimura:One of the best Japanese speciality restaurants in Ho Chi Minh City with a traditional country style setting. Showcases a wide variety of Japanese food including Sushi and Teppanyaki bars and features seasonal and traditional specialities. Daily - 11:30 am to 2:00 pm. Daily - 6:00 pm to 10:30 pm. OJ's:Unrivaled Californian creativity, serving fresh juice blends, selection of coffees and teas, healthy sandwiches, wraps and variety of freshly baked breads, cakes and pastry items. Open: Daily - 7:00 am to 10:30 pm. Sundeck by the Pool:The deck is the place for drinks, ice cream and light fare. Lazing around for dinner is complemented by the view of Saigon by night. The sundeck is also a perfect place for private barbecue parties and Vietnamese theme dinners. Seating capacity is 86, weather permitting. Daily - 6:00 am to 10:00 pm. Bars / Entertainment:Irish pub with a refined "club" atmosphere. Serves an extensive list of drinks complete with hearty pub grubs and golf inspired menu. A perfect place to get together and happy hour is a must! Pool table and al fresco beer garden are also available. Sun to Fri - 5:00 pm to 12:00 midnight. Saturday - 5:00 pm to 1:00 am.